The real deal: My Own Garra Rufa/Doctor Fish Fish Spa Finished! It took quite some time to finally finish my very own fish spa at home. My tank contains about several hundreds Garra Rufa, not sure exactly how many I placed. I lost count. But it is a huge commitment on my part. Every ounce of enery I placed in planting the tank of my dreams. 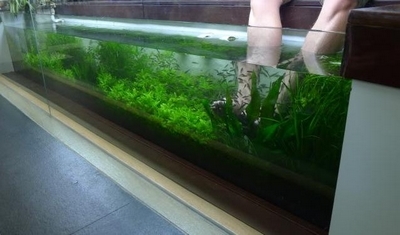 In truth Garra Rufa don't need planted tanks. But I planted mine anyway as to have the natural stream feeling if you're out there dipping your feet in the stream. I don't know if natural streams are clean nowadays though but I got free UV filters with my order so the water remains clean. My Garra Rufa Spa! Pretty neat! Even my relatives are enjoying it! Most of you probably remembered my extra HUGE shipment of Garra Rufa fish from Global Aquatics Inc. Click here to read about it. So this is what I did! A lot of my relatives are enjoying the doctor fish spa. Quite often they are at my house for it. Now, now, maybe I should let them pay! I didn't have enough place inside the house to actually set up my dream tank so what I did was clear a portion of the garage. Took me weeks to get it done. Garra Rufa or Doctor fish is the best spa experience ever! If you're wondering about how I did the planting in the Garra Rufa spa tank. I cultivated and made the plants flourish in another tank before replanting them here. Before adding the plants you must make sure they are clean and thoroughly disinfected. It was not easy as the plants had already taken root so transferring them and acclimation took some time. There were a lot of adjustments that need to be done. I also had attended seminars in Malaysia specifically for aquascaping. I've also read several books by Grandmaster Takashi Amano. I personally wanted to attend his seminars but somehow my schedule could not find the time to fit. You can buy his books at AMAZON.COM. They're really great and informative if you are into aquascaping. I'm going to start breeding my own Garra Rufa! I would like to thank Global Aquatics Inc. for being so accommodating with all my questions. The discounts when I ordered. In my future post I will be posting on garra rufa care and breeding including those for aquariums.